The state of Maine is cracking the market open for self-storing of renewable energy with a collaboration between a wind company and a thermal energy storage company. According to a Maine Public Broadcasting Network report the collaborative Highland Wind project proposed by local wind developer Independence Wind will offer any participating Maine household a $6,000 “wind for oil” grant to store energy at night as heat then use it during the day. The benefit asserted is to cut Maine heating bills in half and show the way to a national model for how renewable power can cut dependence on oil. It can work in Maine as Maine doesn’t have the natural gas infrastructure built out leaving heating oil to heat 80% of the homes. The offers will fund the purchase of an Electric Thermal Storage (ETS) “off-peak heating” unit from the North Dakota thermal energy storage company Steffes, which is partnering with Independence Wind to store the night time off-peak electricity production of the wind farm. Participants can still choose to spend the grant money on any renewable energy or efficiency investment as well. Steffes ETS With Heat Pump Furnace Flow Diagram. Click image for the largest view. A Steffes ETS unit can be an ideal match for wind to thermal power storage. They use lower cost off-peak electric power to heat dense ceramic bricks that are stored in a specially insulated cabinet. 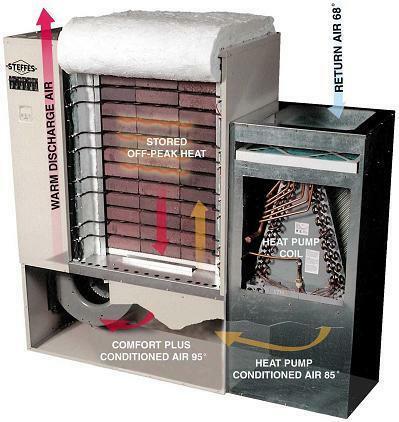 This heat is then available for use throughout the 24-hour day for home heating. Space-age insulation keeps the exterior from heating above 160 degrees F, quite hot enough to burn skin, but below ignition temperatures of most any home materials. Enough heat is stored inside correctly sized units to provide 24 hours of gradual warmth on demand. Both Central Maine Power and Bangor Hydro offer deeply discounted ETS rates for the delivery of this off-peak power, too. Along with the cash for customers that are willing to store heat, Highland Wind will supply the wind electricity to Highland residents at a discounted cost which will be equivalent to about $1.15 per gallon of oil, well below the current $3.00 per gallon price in the area for heating oil. Highland’s 39 turbines will produce approximately 325 million kilowatt hours of electricity per year, which is equal to the combined production of all the hydro dams on the main stem of Maine’s Penobscot River and represents the amount of electricity used by about 44,000 Maine households. The idea follows a smaller program started in 2008 on Vinalhaven Island of Maine, which installed its own 100% wind power and then discovered that they needed a way to store the extra power. That’s where the ‘distributed energy storage’ idea was started in the real world. Distributed thermal storage looks like it will work where the conventional fuels are priced high enough and the wind power is priced low enough. The technology is a huge improvement on a box of bricks; Steffes is heating up electric coils surrounded by ceramic bricks in a sealed container. The ceramic bricks are thermal sinks. They soak up the heat slowly, and when air is flowed through, can release that heat, just as slowly, providing low-cost heating. Resistance heating is expensive even at essentially 100% efficiency. But when paired up with an air source heat pump, the results can be impressive and much more competitive to natural gas. The large market growth will come in the windy Midwest when the natural gas prices climb again or propane gets expensive. From Oklahoma to the Artic Circle wind is a large resource. Thermal storage can move and save heat from windy times to still periods, making the electric grid operator only a transporter, and take some of the pressure off grid operators to invest in other storage mediums. But for now, any heating oil burner with time priced electricity available must be entranced. Customers are going to need a cooperating utility. Time priced electricity would be needed to get the maximum benefit back from distributed storage and power use. Steffes offers the heat storage devices in multiple sizes from room size to commercial units making lots of potential storage possible. So far the competition is pretty light – but expect that to change as more wind producers, utilities and state regulators realize the value that storing heat can offer to those make renewable mandates payoff. Efforts are under way to promote hot water products and we can be sure that wind for summer cooling is also a major target. Much to many folks surprise, wind can be made to work on the cheap – with only a box of sophisticated bricks and smart technology application. Number 1 could work for off-grid wind quite nicely, or it might work well for grid power to take advantage of off-peak rates — if the utility offers two tier pricing. Number 2 retains all of the problems which make large wind farm power unworkable — “a hand grenade thrown into the control rooms of power grids,” expensive, a waste of land, prone to failure, non-baseload, non-dispatchable, etc. etc. Where does the off-peak power come from? A gas turbine? A coal plant? No one can say it will come from a wind farm, since wind power comes and goes whenever it wants — not according to a manmade schedule. Look at it from the perspective of the power grid, which already requires careful balancing and backups. Throw large wind power into the mix and you are asking for big trouble. Kind of a hare brained idea – sounds like a junior college project. Space age insulation? Come on – it is not at all well insulated even by old standards. Al Fin has many good points! This is a pathway to nowhere and nowhen. I guess the question is what is the very best way to store offpeak energy if you want to go off the grid? Storing Ice, molten salt and compressed air all seem like a Rube Goldberg approach. Actually, I think this could work rather well if the storage technology was improved. I’ll bet they don’t use particularly good insulation and bricks in a box isn’t a particularly good thermal storage technology. For insulation, they should probably be using aerogel. At R-10/inch, it is the most effective, though somewhat costly, insulator available. 5″ of aerogel would do the same as 16″ of R-3 fiberglass batt. R-6/inch closed cell foam works well too, but emits greenhouse gas during formation and would bulk out the box by 8″. Since the application here wouldn’t need much material (unlike, for example, insulating a house) the extra cost associated with aerogel might not be such a problem. For the thermal mass, they should be using a phase change material. These store latent heat rather than sensible heat, by changing phase, typically from solid to liquid. PCMs are available that change at various temperature points through the full temperature range from 0C (water) up to around 90C, and even higher with more exotic PCMs. Latent heat storage is typically 10x sensible heat storage, not has much a difference as for chemical energy but still quite an improvement. Neither aerogel nor PCMs are as cheap as fiberglass and bricks so it would rquire a cost analysis to see whether it makes sense given the additional energy savings. Well, that’s the whole point, isn’t it? To match the unpredictability of the wind with the flexibility of the electric thermal storage? As an aside, grid operators can and do use electric thermal storage to help balance the flow of power just as well as they can use generators. Instead of sending out a signal to a generator saying “please turn up” they can send a signal out to the heaters saying “please turn down.” Since the heaters have embedded storage, they can respond to frequent requests to modulate up and down without bothering the occupants. Jak, we’ve been speculating about phase change materials and insulation. But cost is really an issue. Do you know how much PCMs cost per stored kWh? I think it’s a great idea. For the naysayers, it’s a given that there is no “perfect” solution. I’d like a free lunch, too, but there is no such thing — only “better” solutions. Jessica made Point #1 best: unpredicable wind is stored as a predictable power source (storage — be it for wind or solar is key — need power when it’s not windy or sunny). Point 2: Sure, this increases electric use (though, importantly, off-peak), but that *appears* to be more than offset by the decrease in oil use (assuming people are switching from oil to this solution) given the efficiency. Additionally, there are many homes (granted, not in Maine) that are heated by expensive electric. If/when these homes convert to this system, there would be LESS demand on the grid for elec heat during peak hours because of storage capability of this system. Supposedly in Maine, homeowners will get a $6K grant for switching to this system. The total costs situation is not clear??? Is there a cost to the system?? Meaning what is the *initial* out-of-pocket cost to convert to this system? Thanks.